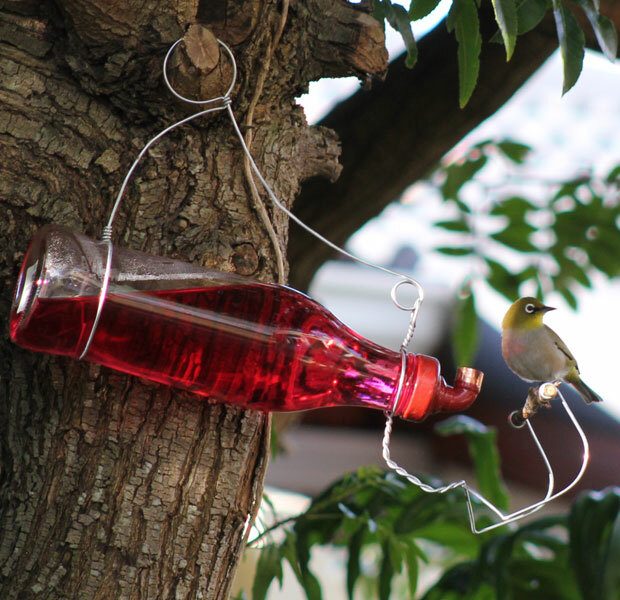 I hung the new bird feeder on Saturday after following the instructions that came with it and on Sunday I saw my first bird – although fleeting. I peeped through the window wondering whether any birds had been and there was one. He darted off very quickly though. Since then, I’ve looked a few times and believe it or not, every time I’ve seen a little visitor! What Joy! This afternoon I sat for a few moments (camera in hand) hopeful that I might get a photo and three arrived at once, a beautiful Sunbird that was chased away by this Witoogie. Witoogie then spent a few minutes sitting, drinking, looking around, drinking again and then off he went. (Click the photos to see the large versions). The bird feeder came with instructions to add red food colouring the first time as it attracts the birds to the new feeder. Once your feeding station “becomes known” by the birds, you stop using the food colouring. The feeder comes with two different “nozzles”. The short one (which I have on mine now) is for short-beaked birds. The longer one is for sunbirds and long beaked birds. As I witnessed, some of the short-beaked birds are bullies and will dominate the feeder so the answer is to have two – one for the Sunbirds and one for the others. Now that I know it works and that the birds will use it I will get another. Haha! It’s a slippery slope. 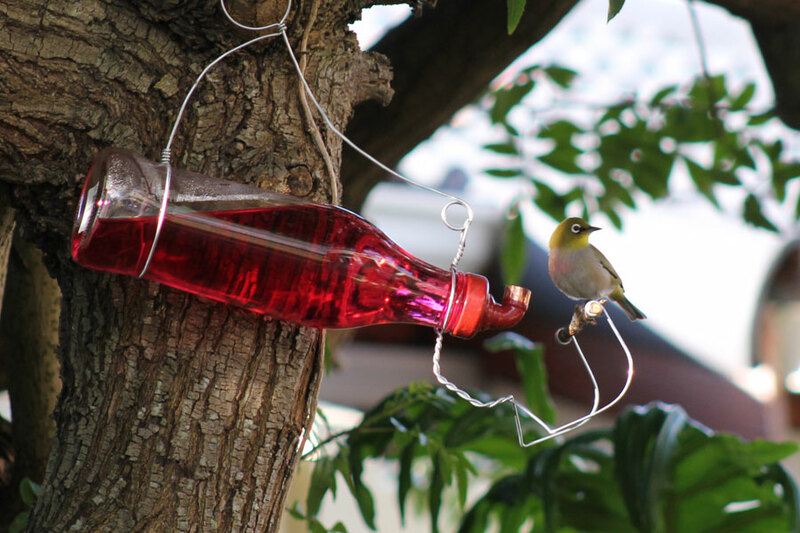 It starts with one feeder, and then before you know it, you’ll have a dozen! It is exciting when the birds find the feeders so quickly though. Your little bird does look very happy with his find! 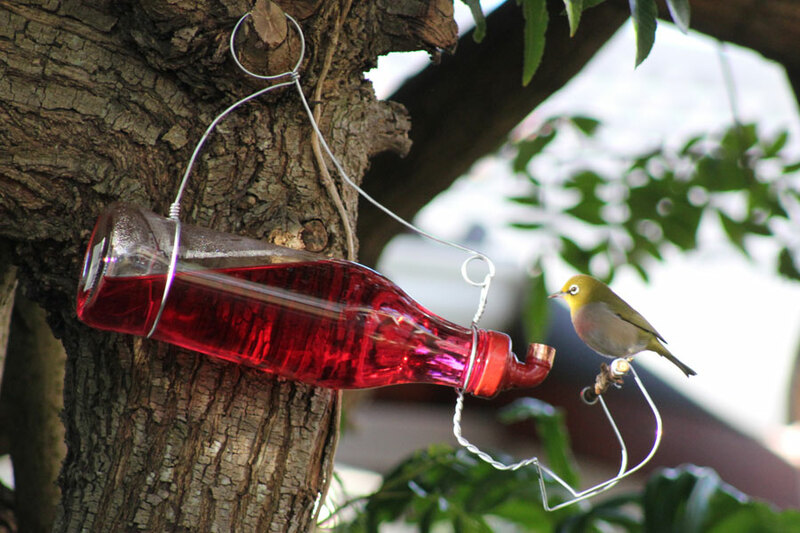 What a nice encounter you’ve had and the anticipation of many more would definitely make purchasing another feeder worthwhile! The colors are so vivid with the red food! What an unusual bird feeder! Here, we use red coloring to attract hummingbirds. Do you have hummingbirds where you are? That’s beautiful; the feeder, the bird and the photos. All the little critters and sometimes the birds too just drink direct from my lotus pot. What a great feeder! I love it. He certainly looks happy to have a sweet treat! When I came to the first image I LOL because the feeder is so cute. Seems like you could make it your self with a glass bottle and a stopper from an olive oil carafe. It seems like the witoogie read the instructions too. It’s amazing that a wild creature would know what it was for, let alone how to use it.